Don't we all occassionally need a good recipe that we haven't worn out already? 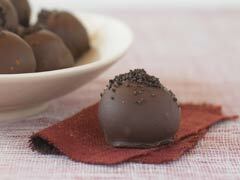 I recently came across a recipe for Oreo Truffles. I think they'll make the perfect addition to a holiday party, date night, or simply a 'just because' treat! CRUSH remaining 36 cookies to fine crumbs; place in medium bowl. Add cream cheese; mix until well blended.